Powder is something that I cannot live without. My skin isn't particularly oily but I just don't feel right if I haven't used something to set my foundation. In the past powders were associated with a chalky looking finish. The last thing you want is for a powder to actually look powdery on your skin. I really like mineral powders because I feel like they give the most seamless finish & make my skin look naturally perfected. 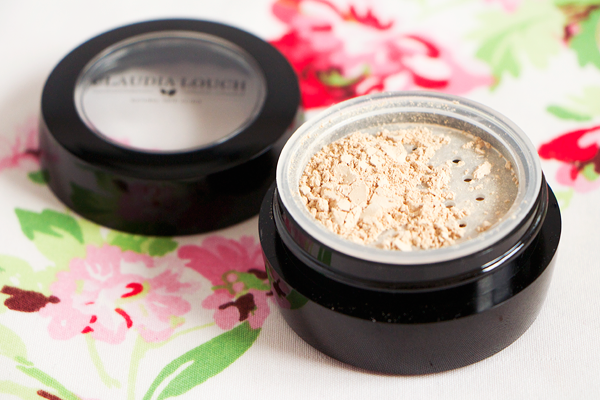 At the minute I'm really loving this Mineral Loose Powder from Claudia Louch. I'm often wary of brands who try to do both skincare & makeup as one is inevitably not up to the standard of the other. 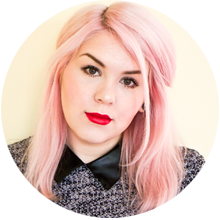 Claudia Louch's skincare products are utterly fantastic so I was rather keen to find out how her makeup range measured up. Presently the main focus of the makeup line is base products. You won't find fancy eyeshadow palettes or bright lipsticks in her shop but then that wouldn't be entirely appropriate to the brand. The clients of the Natural Skin Clinic visit there to fix their skin so it makes sense that any cosmetics sold are intended to further enhance the complexion without aggravating any pre-existing skin conditions. As with all the Claudia Louch Natural Skin Clinic products, this powder is 94% natural, hypoallergenic, allergy-tested, non-comedogenic and free from fragrances & harsh chemicals. It is suitable for use on all skin types & many skin conditions. The Mineral Loose Powder is incredibly finely milled & glides effortlessly onto the skin. It helps to absorb excess oil & reduce shine. It won't cake or clog your pores either. The powder comes in a black plastic pot with a sifter. Loose powders can be a bit messy to use but this packaging is well designed & it's easy to tap out just the right amount of product. One thing that sets this powder apart from many others is the inclusion of jojoba oil. I adore the Claudia Louch Protective Jojoba Day Moisturiser so this ingredient stood out to me when I had a look through the list. It acts as an anti-inflammatory & helps to dissolve excess sebum so this powder is ideal for anyone prone to clogs or breakouts. Jojoba oil naturally warms to your body temperature which allows the powder to blend really well so it won't accentuate any dry patches. The result is a velvety satin finish which just looks wonderful on the skin. I was sent the shade MC2 Warm Yellow which I have to admit did worry me a little. It's rare that base products in anything other than deathly pale shades suit me but this colour looks really natural on my skin. Although the powder is beige in colour, it has very little pigment so it looks almost translucent once applied. It's more of a setting powder than a powder foundation but still looks fab when used on it's own. It doesn't offer masses of coverage but it manages to even out the complexion, reducing redness & giving the skin a smooth, poreless appearance. Combine it with something like NARS Radiant Creamy Concealer for the ultimate 'no makeup' makeup base. 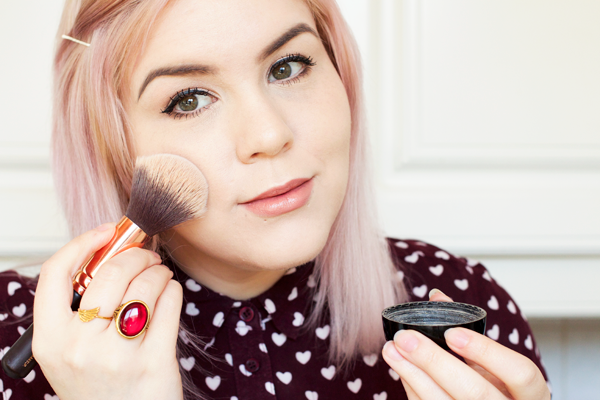 I generally like my skin to look as flawless as possible though so my favourite way to use this product is as a setting powder. It helps to keep my foundation in place & finishes off my makeup beautifully. It brings some instant radiance to my face & gives my skin a lovely silky texture. In the above photo I used NARS Sheer Glow Foundation before applying the Mineral Loose Power with a Zoeva Powder Brush. My face never normally looks this glowing without a hefty dusting of highlighter but this powder really gives you that 'lit from within' look that so many of us desire. At nearly £50 this powder is definitely a luxury item. However anyone with extremely reactive skin will know that finding makeup that won't clog your pores or cause irritation can be rather difficult. I would highly recommend trying out some of Claudia Louch's products as they have been specially formulated for use on even the most sensitive skin. 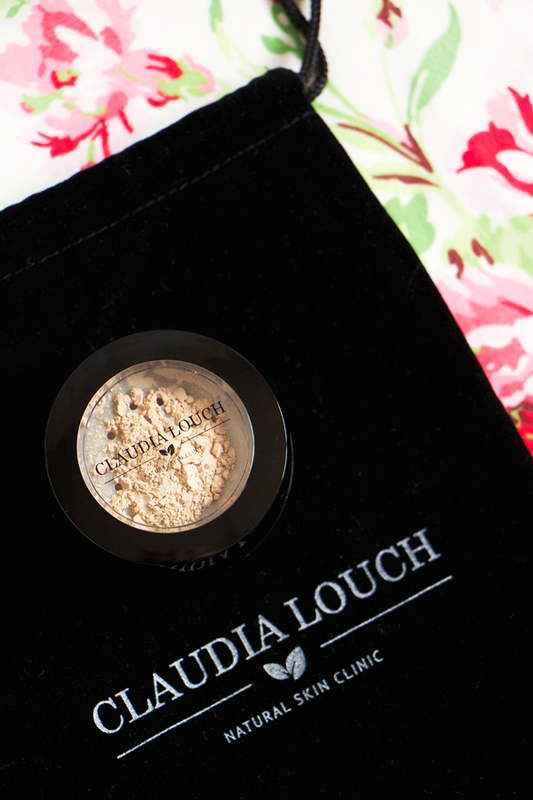 If this Mineral Loose Powder is anything to go by, then Claudia Louch is one brand where I can safely say that the makeup is just as good as the skincare. Hello, sounds nice! definitely something I need to investigate...Price is a little steep though. This sounds ace but that price! !